On the occasion of Eadweard Muybridge’s 189th birthday, we are pleased to announce the addition of our new virtual reality collaborators, executive producer Lisa Watts and director Saschka Unseld. Lisa earned her chops producing virtual reality content at Intel; Saschka is simply one of the best VR directors in the world. Check them out on our “about us” page. Saschka and Lisa are busy conceiving Becoming Muybridge, a virtual reality companion to Exposing Muybridge that will transport users into the life and work of Muybridge like never before. 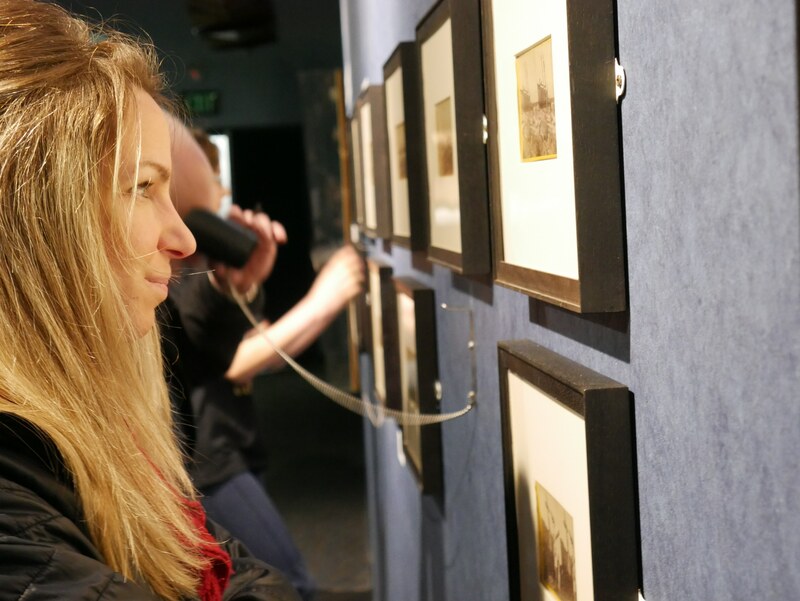 Muybridge in Alaska: 1868 is up and running at the Sheldon Museum in Haines, Alaska. Spread the word. 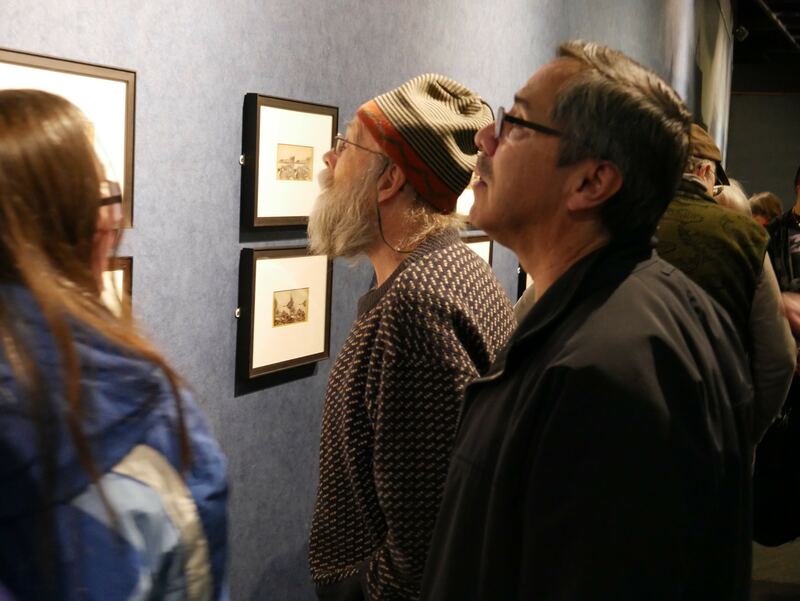 Native Heritage Center in Anchorage, Muybridge in Alaska: 1868 will be on display at the Sheldon Museum in Haines, AK, beginning April 5 and running through May 31. If you are in the Haines area, check it out. New locations and dates are in the works, so check back for updates. 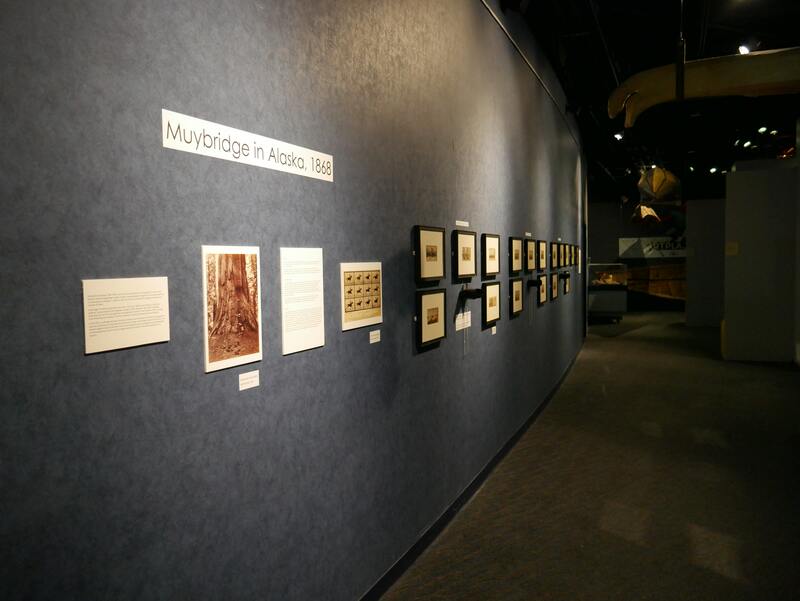 Muybridge in Alaska: 1868 opened today at the Alaska Native Heritage Center in Anchorage. 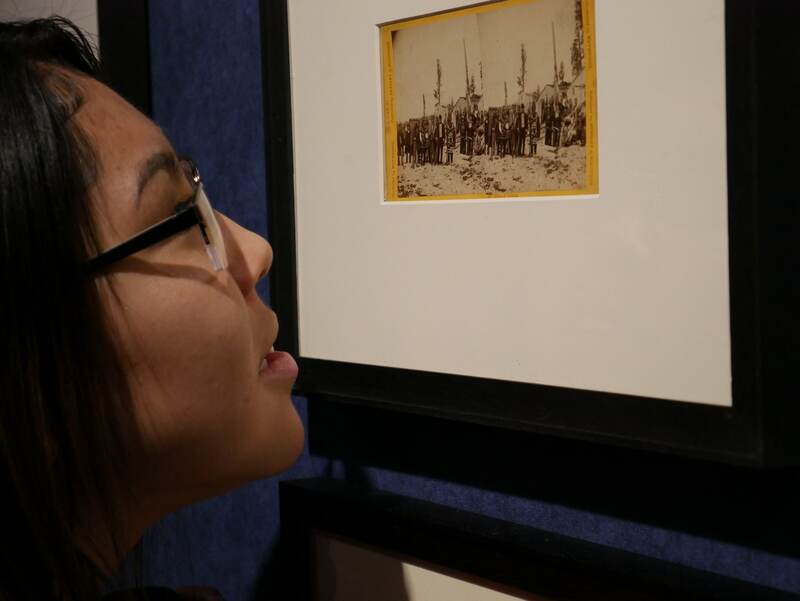 Visitors, including some Tlingit people related to figures in the photographs, were delighted to see these original 1868 Muybridge photographs of Alaska, the first of Tlingit people and of the territory to be widely seen. 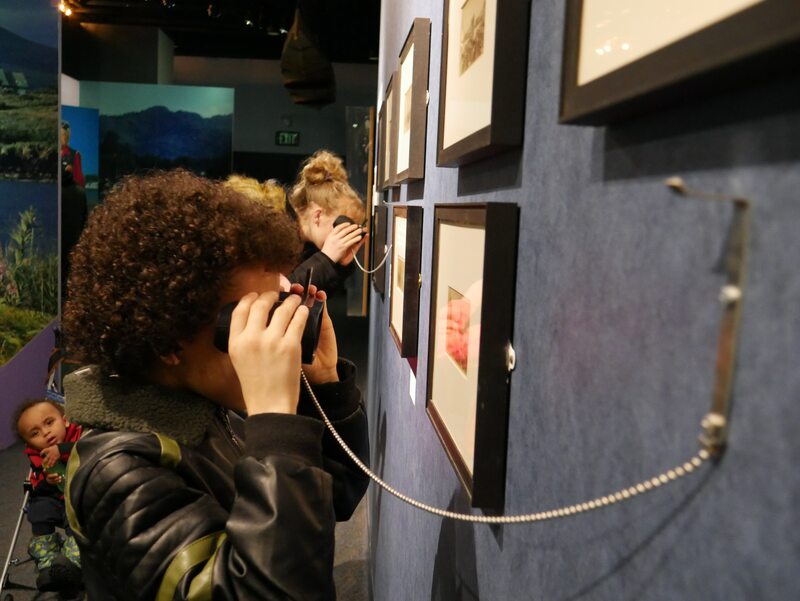 Visitors appeared to be especially excited to view the photographs through special twinscope viewers, produced by artist Colleen Woolpert, that transform the stereo views into single 3D images. Thanks to Loren Anderson and Stephen Blanchett and the ANHC for hosting the exhibition, and to Angie Demma for production support. 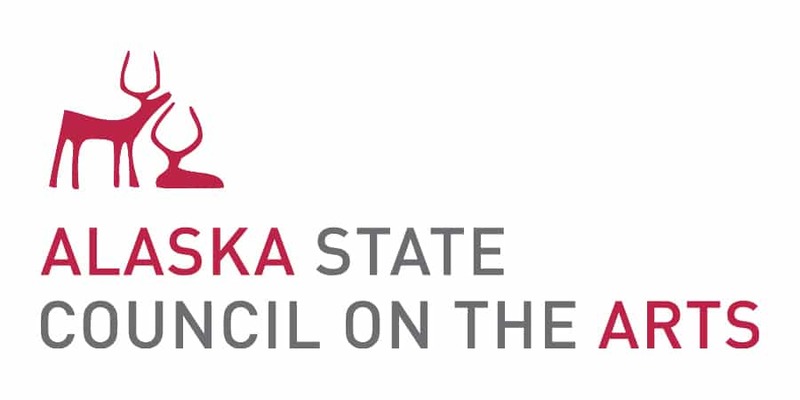 We are indebted to our sponsors: the Atwood Foundation, the Alaska Humanities Forum, and the Rasmuson Foundation through the Harper Arts Touring Fund of the Alaska State Council on the Arts. 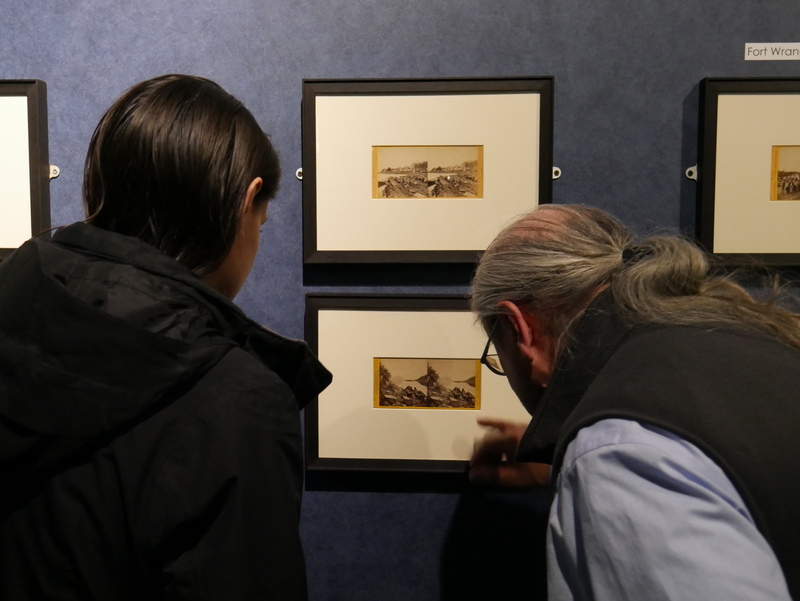 A final shout out to Mary Everson who shared her family’s very rare photograph, inscribed by Muybridge, that features her ancestors, and to Len Walle who lent 16 cherished Muybridge stereo views and has been a valued partner throughout the planning and execution of the show. Some photographs from the opening. Copyright: Marc Shaffer. We are excited to announce that Muybridge in Alaska: 1868, an unprecedented exhibition of Edward Muybridge’s 1868 photography of Tongass, Wrangle (sic) and Sitka, Alaska will premiere Saturday, January 26, 2019 at the Alaska Native Heritage Center in Anchorage. The exhibition will run through the end of March, before traveling to the Sheldon Museum in Haines, Alaska. Stay tuned for news of a possible Sitka stop in early summer 2019. On January 26 from 4-6 PM, the Alaska Native Heritage Center will host a public forum to discuss the photographs. Panelists will include celebrated Tinglit glass artist and musician Preston Singletary, Tlingit authority Tom Harris, University of Alaska anthropologist Dan Monteith, and exhibition organizer and Exposing Muybridge director Marc Shaffer. 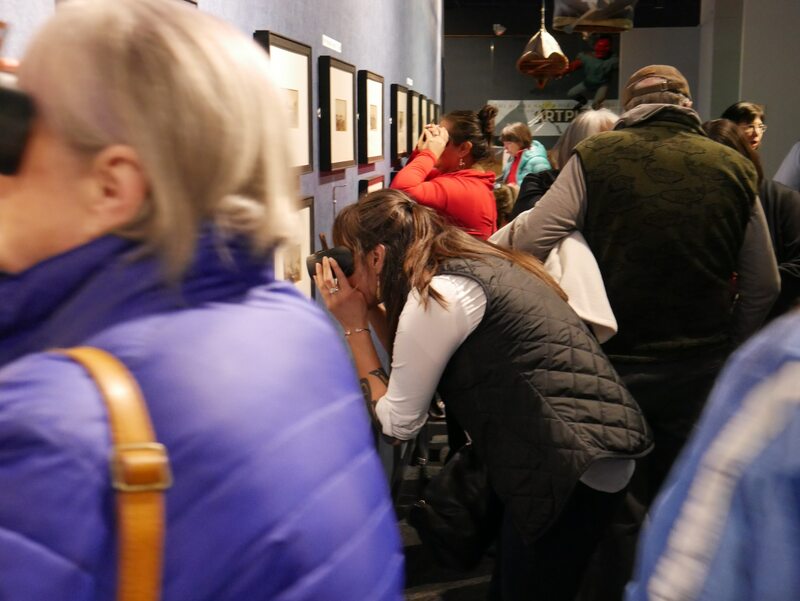 The exhibition features 16 original Muybridge stereo views on loan from the collection of Leonard A. Walle and a carte de visite photograph inscribed by Muybridge to a Tlingit chief loaned by Mary Everson. 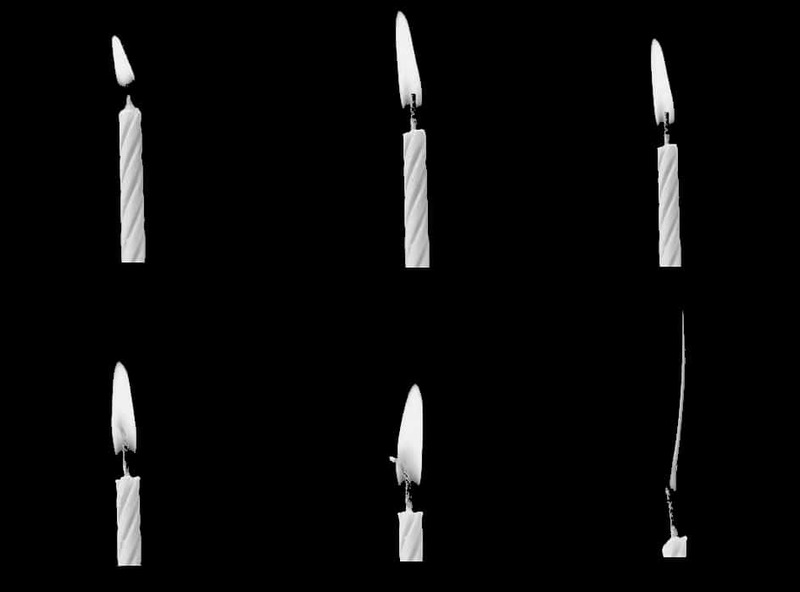 Muybridge in Alaska: 1868 is made possible with financial support from the Atwood Foundation, the Alaska State Council on the Arts, the Alaska Humanities Forum, the host institutions. 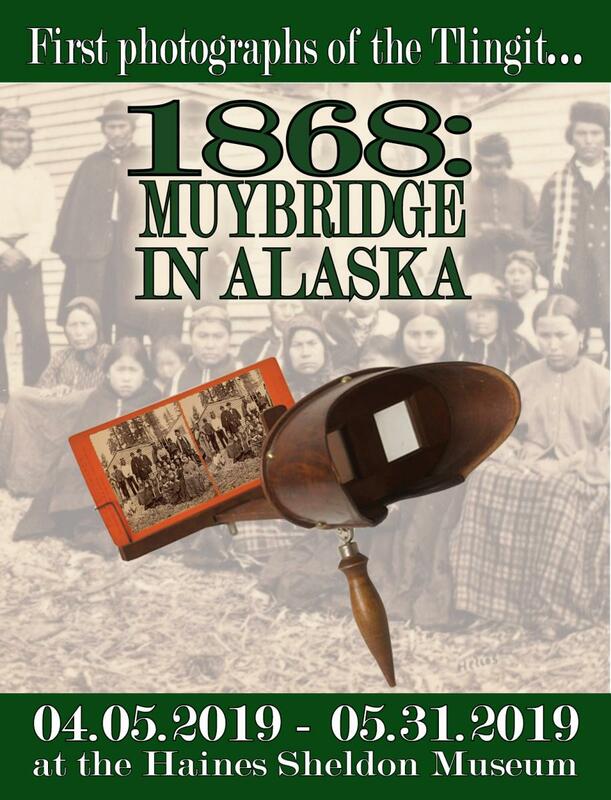 The Alaska State Council on the Arts has awarded a Harper Arts Touring Grant to Muybridge in Alaska: 1868. We are grateful to our partner Helen Alten of the Sheldon Museum in Haines for serving as applicant and managing the grant, and to Laura Forbes and the Alaska State Council on the Arts for their generous support. Muybridge in Alaska: 1868, an unprecedented exhibition of original Muybridge views of Alaska. Taken by Muybridge in August 1868, these are the earliest photographs of Tlingit people, of Southeast Alaska, and are the first of the territory to be widely seen. Muybridge in Alaska: 1868 will go on display at the Alaska Native Heritage Center in Anchorage beginning in January 2019, before traveling to the Alaskan towns of Haines and Sitka in the spring and summer. We have renamed our documentary and virtual reality project Exposing Muybridge, retiring our original working title, Splitting the Second. We can’t promise we won’t rename the project one last time as we got closer to release (still a long ways down the road), but we like Exposing Muybridge for its reference to photography, to Muybridge’s penchant for getting naked in front of the camera, for the inclusion of “Muybridge” in the title, and because it captures our mission to reveal a deeper meaning to Muybridge’s life and work, one that says as much about us as it does about him. Tell us what you think by emailing us at info@nullinsideoutmedia.org. 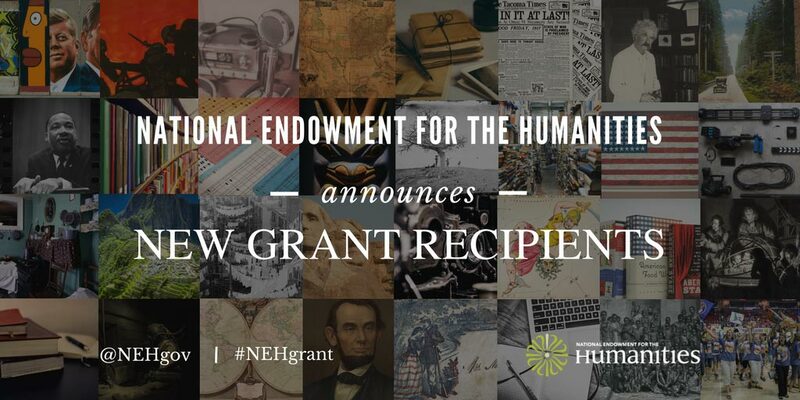 Splitting the Second has been awarded a rare and prestigious NEH development grant.